Best Advice I Ever Received: Do what needs to be done – even when it’s not what you signed up for! Best Advice I’d Give To Someone Who Wants To Build A $10m+ Business: Start small and learn from your mistakes; get your act together before you take your show on the road! How Barefoot Wines started on accident and grew to the internationally known brand it is today. Being resourceful to become innovative. Worthy cause marketing and how it can help grow your business. Timing can make or break a business – make it work for you. Strategic value of a business. Do what needs to be done – even when it’s not what you signed up for! Do not underestimate the cost of sales. Don’t scale fast to fail fast, scale slow and don’t fail at all. Have all of your documents together before you look to sell. 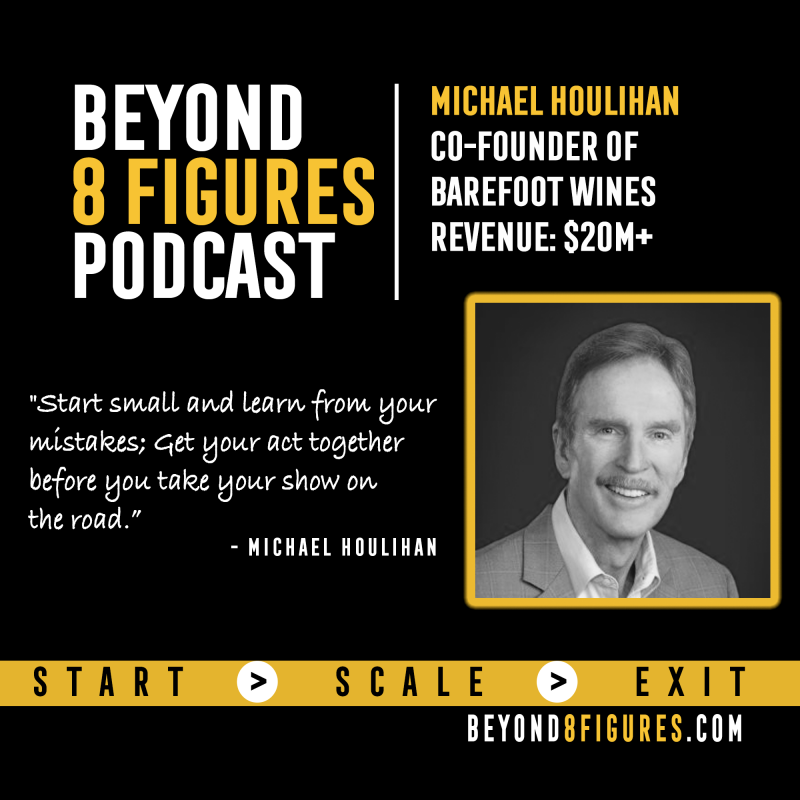 Michael Houlihan is the Co-Founder of the world’s largest wine brand, international Keynote Speaker, and New York Times Bestselling authors of The Barefoot Spirit, How Hardship, Hustle, and Heart Built America’s #1 Wine Brand and The Entrepreneurial Culture, 23 Ways to Engage and Empower Your People. From humble beginnings in a laundry room of a rented farmhouse to the boardroom of the world’s largest wine company, E&J Gallo, he learned valuable lessons crucial to any business. He consults and trains startups and Fortune 500’s on brand building and company culture. He is highly recommended by companies seeking to increase their sales, and engage, empower, and inspire their people. He is a regular contributor to The Business Journals in 43 cities nationwide, Entrepreneur, and contribute articles & interviews to INC, CEO Forum, Forbes, and other major business publications. He is a regular media guest on radio, television, and podcasts.